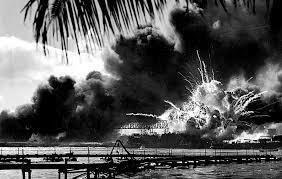 Marked the United States entrance into a war that would affect nearly every nation and take the lives of over 50,000,000 people. Until that day in 1941 the general consensus of the American people was that of King Thoedan in Lord of the Rings ” I will not risk open war”. The people of the United States did not want war, but war was upon them. The desire to avoid war is normal, but when war comes to us, we must respond.Hundreds of thousands of young men, my father among them did in those dark days following December 7th 1941. But the hope in time of war is that eventually peace will come. And in the war that is upon us, in our time, we also hope for peace. The angels proclaimed in those fields so long ago “Peace on earth, goodwill towards men”, but as we look upon our world we find little peace. Our hope in this time of war is that the peace our Savior brings would capture the hearts of people everywhere. Peace with God, peace with one another. In this war we must respond bringing that message of peace. This is written in honor of all who lost their lives on that day in 1941, and in the days that followed. To those who served in hope that through their sacrifice, peace would eventually come.